If you do not have the Adobe Acrobat Reader, you can download it free of charge by clicking on the icon to the left. Please Note: You will need Acrobat Reader 5 to open these files; an earlier version will give you an error message when you try to open the file. For technical questions or errors on the forms, contact Karen M. Ing. 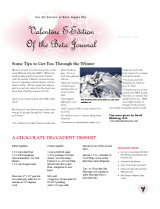 Go to the BJ E-Edition Submission Form to submit your articles for the Beta Journal E-Edition Online. No more than two articles per member/chapter/council. Click on the pictures in the left hand column below to begin the download process. 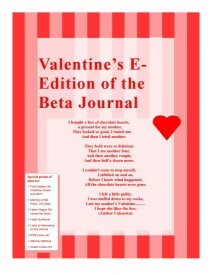 What's Inside the Beta Journal and 25 plus items from the Beta Shoppe. Document is 10 pages total. Click on the Links Below to go directly to the Beta Shoppe to view items on a Larger Scale and seek additional information on ordering items. Thanksgiving, Comupter Tips, Online Alpha, Web Links, Veterans' Day and More... Document is 10 pages total. Sisters Holiday Memories, Online Legacy Alpha, Online Beta, Web Links, I-6 Convention & Poems of Christmas and More... Document is 12 pages total. Sweet Pea Pot, Valentine Food for Thought... Document is 6 pages total. Mother's Day, Saudi Arabia chapter, I-6, Panama Canal, Yardstick, Strawberry Patch and Party Plans, May/June Conventions... Document is 8 pages total. Sister Tips on Packing That Bag for Travel, Otter Creek Trails in NY, Sisters Top 5 to 10 Picks for Travel Destinations (20), Discontinued Items in the Beta Shoppe (Yellow Rose Flag - New Item), Rose Sugar in a Jar, Yearbooks, I-6 & Panama Cruise... Document is 7 pages total. Think Outside the Lunch Box, Great Breakfast Recipes, A First Year Chapter History, Gift in a Mug, Envoy Joe's Rub, Mixes, Themes Shirts, Books, Inside the Gift of Sisterhood, The Giant Ribbon, Letter to Laura/Sisters, Florida Hurricane Relief, Strawberry Patch, Mexican Riviera Cruise & Panama Cruise... Document is 7 pages total. Blessing Mix, Turkey Talk, Marilyn's letter concerning Bill, Christmas gifts - wish & Gift from Daddy, Beta Shoppe Items, Disaster Fund... Document is 6 pages total. Beta Sigma Phi Sister Gift Stories, A Sisters Hobby Becomes a Published Reality, The Gift of a New Year, Take the Train to Clarksville, TN, Wright Family Sagas (3), The Gift by Jack Ross, Strawberry Patch Additions, Beta Shoppe Items Canadian T-shirt, BSP Apron, Yellow Ribbon Magnet, Set of 12 Recipe Cards, Newly Revised Membership Application, 11 Convention Listings... Document is 7 pages total. $10,000 Service Project, Polly the Perfect Pledge, Bunny Bread, Fantasy of Lights - Canadian Sisters, Florida Wreath Raffle Winner , 3 New Convention Listings/1 Convention Update... Document is 4 pages total. Story of Mothers as Told by Sisters, Think Pink Story... 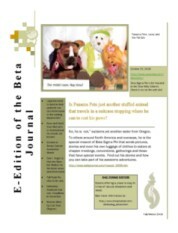 Beta Shoppe Items, Yardstick, Theme Art, 1 New Convention Web Listing/3 Added Chapter Links... Document is 4 pages total. Scrapbook Suggestions and Word Search, Progressive Beginning Day, Beta Shoppe Items, Conventions, New Strawberry Patch Items in PDF VII, Panama Canal, No More Sister E-mail Links and Online Dinner in KC for all sisters... Document is 4 pages total. Turkey Facts, How to Make a Purse, Dog Treats, Jack-O-Lantern Survival it, International Bed and Breakfast, Chapter Interest and Checklist, New Beta Shoppe Items (bookmarks, yellow rose kits, ss cards and sisterhood pins) ... Document is 6 pages total. Holiday Recipes sent in by sisters - Easy Rumptopf, Easy Chunky Chocolate Chip Cookies, Cranberry Sour Cream Crumble, Starbuck's Cranberry Bliss Bars, Holiday Website Pick by Sisters, 75th Anniversary BSP Book... Document is 6 pages total. Magical Celebrations and Book Donations, Photo Gallery of Hurricane Wilma in Key West, Envoy Information in the Strawberry Patch, New Beta Shoppe Items, Valentine Sweetheart Revealing Ideas from Sisters... Document is 6 pages total. A Yellow Rose Story Game, Summer/Fall Conventions, Party Plans, Panama Pete Hits the Road, Beta Shoppe Items, Laura Ross Wingfields Thoughts on the Theme, Fast & Easy - Ways and Means, Wooble's Place, Patch updates and Legacy of Love ... Document is 4 pages total. BSP THEMATIC JOURNEY by Karen Ing, Vegas Convention, BSP in Business Links & Chapter Page Hosting - Free, Gift Wrapped Box Relay Social, Story Behind the Woman of the Year Pin, Hurricane Survival Kit in Zip Lock Bags, Tea Cup Installation of Officers, Theme Art b/w Pieces, New England/Canada Cruise, 75th Anniversary Cake, Fall Conventions 2006, Panama Pete in Lake Cowichan, BC - Canada w/ Delta Sigma, Chapter Fund Raiser, Beta Shoppe Items ... Document is 10 pages total. Yummy Apple Dumplings, The Beta Journal Fall Foliage Cruise Sept 28 - Oct 7, 2007, Memories of Sisters Helping Sisters, Rosebud Napkin Folding, Intl Cruise, Sister Selected Web Sites, On Line Dinner, On Line Chapters, On Line Legacy Alpha, Beta Shoppe Items, Sister Written Installations in the File Cabinet - Nov 1 ... Document is 10 pages total. Winter SAD, Mmm! Chocolate, The Beta Journal Fall Foliage Cruise Sept 28 - Oct 7, 2007, International Gift Discounts Extended to Founder's Day, Let's Go to Convention, Valentine Symbols, Don't Forget Your Sisters - story, Beta Shoppe, Tunnel of Fudge Cake, Extreme Makeover Home, From the Friendly Venture Department, More Theme Art from the Past, File Cabinet - What's New ... Document is 5 pages total. New Links to Theme Art, Ideas, Wooble, Yardstick and More...Tailgate It with Envoys - May 15th, The Beta Journal Fall Foliage Cruise has balconies available in E1 Category Sept 28 - Oct 7, 2007, Panama Pete heads to CA Convention, See upcoming convention dates and themes, Sisters say thank you to the Strawberry Patch Pledge Training, Music Party Ideas, Pledge Training Retreat, You Tube Video that Aired on BRAVO TV Information, BETA SHOPPE, LIVE TO Build Bones, "Imaginary Girl" donates proceeds to INTL Endowment Fund, Men's Appreciation Social, File Cabinet - Songs from the Beta Sigma Phi Song Book - Order the Songs and Music from the INTL GIft Department... Document is 7 pages total. Getting Reading for Thanksgiving, A Cookie Swap, Calendar, Coffee Cake Muffins, Play Scattergies, Beta Shoppe Items: Theme Shirts, Aprons, Key Chains, Ornaments, T-Shirts, Totes, Blinking Yellow Roses, Pins and More... Document is 7 pages total. Theme Ideas and Art, Yardstick, Legacies, Digital Cameras for Our Troops in Germany, Extreme Make-Over Ritual of Jewels, Conventions, Beta Shoppe Items - Theme Shirts, Bear Pin, License Plate, BSP Shirt, Jewelry and More... Document is 4 pages total. Deadline for All Article Submissions is the 25th of each Month. Any land sister or cyber sister is welcome to submit articles for the E-Editions.